Welcome to the St. Francis first-grade program! We are pleased that you have considered St. Francis for your child. Our program continues to nurture the Catholic values instilled at home. Parents and teachers work cooperatively to build a partnership between home and school. First grade is a time of growth and discovery. Children are learning many new skills, both academically and socially. They are beginning to learn about the world, and their place in it, and are awakening to a journey as lifelong learners. First graders, throughout the year, make amazing strides in their reading, writing and mathematics skills. First graders also delve into a variety of content areas regarding science and social studies. Of course, at the heart of our curriculum is our Catholic faith. Our students are learning about God, their Creator and Loving Father; Jesus, His Son; and the gifts of the Holy Spirit. As a Catholic school family, we learn about, as well as live, our faith. Our first-grade program helps the children come to know Jesus and to celebrate the Good News. Through daily activities, prayers and practices, the children are invited to grow in faith as they come to understand God’s love, the life and teachings of Jesus and what it means to belong to the Church. We show Jesus that we love and respect the awesome gift of His true presence in the Eucharist as we participate in Eucharistic Adoration once a week. Using our Christ Our Life religion resources, we learn about the birth and life of Jesus, God’s Law of Love, the Eucharist, and the Resurrection. 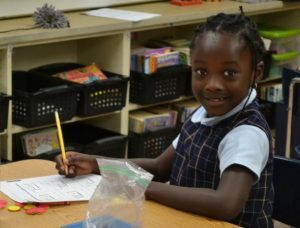 First graders learn to pray together in the classroom all year long; they also participate in school Masses. We study Church doctrine through the stories and parables about Creation, Jesus, Mary and the Holy Family. We help the children to develop their Christian morality by respecting others and living according to God’s way. First graders recognize and observe Catholic traditions throughout the liturgical calendar: All Saints’ Day, Advent, Christmas, Lent, Easter, Mary’s Month and Pentecost. Our children learn to put faith into action by participating in Christian service projects, which reach out to others within the local area and the world community. Each year the St. Francis of Assisi School staff determines a specific set of values that are high-lighted throughout the year. These values also form a basis for classroom discussions. Service projects and school-wide activities are often linked to the values. First grade classrooms will use the F.A.S.T. Reading Program. This is a research based literacy intervention program that features a flexible and quick paced approach. It combines the best of systematic phonics and literacy-based instruction to create a streamlined, hands-on program that transfers immediately to the reading process. The F.A.S.T. lessons deliver the phonetic component of reading using a multi-sensory approach: a magnet board and letters to build phonemic awareness and orthographic processing skills. Students then learn to spell and read syllables and complete words using the magnet board. Working on a magnet board makes it possible for many words and concepts to be taught and reviewed quickly. New concepts are introduced using the magnet tiles with minimal verbal instruction by the teacher. In the F.A.S.T. program, students learn letter and sound identification, blending, segmenting and manipulation of sounds. F.A.S.T. students understand the English language and its structure and gain access to the code and quickly transfer this to their reading. To encourage reading at home, first graders are expected to independently read and/or be read to at home at least 20 minutes every day. Students will also enjoy author studies and thematic reading units throughout the year. In first grade, the students will not have a phonics book. The phonics lessons will go hand in hand with the F.A.S.T. reading program. Some of the phonics skills that will be learned throughout the year are beginning and ending consonant sounds, short and long vowels and vowel patterns, consonant blends, digraphs and word endings. First graders use concepts implemented through the F.A.S.T. program to learn to spell words in isolation and in context and to use correct spelling for high-frequency and phonetically regular words. The spelling of nonsense words will also be used in our program and combined with reading. First grade uses the Home Run Hitting handwriting series. This program also links up to the F.A.S.T. reading program. Proper posture and pencil control are important. We also focus on the shape of each letter, how it is formed and where it falls on the handwriting guidelines. Baseball metaphors and sayings will be used to aid each student with the proper placement of letters and formation. First-grade writers use the 6+1 Writing Traits curriculum along with Writer’s Workshop. We teach various forms of writing (descriptive, narrative, expository, creative, persuasive and literature response) through the 5-step writing process: prewriting, writing, revising, editing and publishing. Embedded in this writing curriculum is instruction on the six traits of good writing: ideas, organization, voice, word choice, sentence fluency and conventions. Our comprehensive math program helps first graders develop their thinking skills in a variety of ways. My Math includes diagnostic, formative and summative assessment; data-driven instruction; intervention options; and performance tracking, as well as remediation, acceleration and enrichment tools throughout the program. Children learn number order, patterning, graphing, story math and place value through the use of hands-on materials as well as workbook exercises. Introductory skills include fractions, geometry, measurement and counting money. Students will also receive additional support three times a week in with our Math Enrichment and Remediation (also known as RtI). Students will work in small groups on the main math concepts and standards for each math chapter. During this additional math time, teachers are able to re-teach concepts, give students extra practice on concepts, or even extend the content to higher-level thinking activities. Through use of the Scott Foresman Social Studies series, first graders learn about problem solving, the importance of rules, community, basic economic principles and respect for our country and its symbols. Other social studies units include Native Americans, African-American history, women’s history, presidents, natural resources and geography. First graders will use many tools for learning. These include calendars, maps and map keys, charts, globes, time lines, diagrams and bar graphs. We supplement this series with current events and topical themes through the Scholastic News magazine each month. Students will be instructed in a variety of science units. The Macmillan/ McGraw-Hill science program is divided into three sections: Life Science, Earth and Space Science and Physical Science. In the life science unit, first graders will learn about the parts, functions and life cycle of plants and animals. Students will compare and contrast the similarities and differences among plants and animals. They will also identify the basic needs of different animals, their habitats and their adaptations. The Earth and space science curriculum will cover units about the Earth, how we can take care of the Earth and also units on the weather, the seasons and the sky. A very fun unit on matter will be taught with the physical science curriculum where students will examine and explore the different properties of matter: solids, liquids and gasses. Students will also learn important ways to stay healthy by building healthy habits and learning the basics of good nutrition when we study the food pyramid. Throughout the year we will continue to work on special experiments and investigations where we will sharpen our observation skills and methodological approaches that are needed in science. We hope you have your science goggles and lab coats ready for some exciting lessons in science! The focus of the primary grades’ art curriculum is to build interest and confidence in creating art. The art concepts of cutting, shape recognition, drawing, color wheel, painting, paper construction and clay construction are taught in a cumulative fashion through both two-dimensional and 3-dimensional projects. There is an introduction to the artwork of different cultures and various artists. Students are introduced to simple keyboarding techniques focusing on the home row. Basic word processing and editing of written text are developed skills. Students use Kidspiration for brainstorming and learning how to organize ideas. The Internet is introduced with pre-screened websites that are integrated into the classroom curriculum. Internet resources are used to reinforce math skills. Spanish class students will become acquainted with the Spanish language through fun, entertaining activities with puppets, music, picture cards, stories, skits, projects and vocabulary games. Learning about countries and cultures of Latin America and Spain will also be part of the Spanish program.